Pest insects are one of the most disheartening issues a horticulturist can experience. After spending countless hours perfecting the beauty found within a greenhouse, the last thing a hobbyist needs is a destructive pest insect. Although plants grown outdoors can still develop pest insect issues, plants grown within a greenhouse or an indoor garden are particularly susceptible to a pest insect infestation. Plants grown in a greenhouse or indoor garden are part of a closed system. In other words, natural predators such as birds or other insects are unable to keep the pest insects in check like they would be able to in an outdoor garden. The isolation created by an indoor garden environment allows the gardener heightened control over virtually every aspect of plant growth except pest insect infestations. That is why greenhouse hobbyists and indoor horticulturists need to be ready, at any moment, to battle an unwanted attack from bugs. A gardener can take many different approaches when it comes to dealing with pest insects. Many of these approaches involve spraying the plants with an insecticide. Insecticides are substances designed specifically to deter, destroy, or disable pest insects. Whether it is from reading the latest article on the continued collapse of bee colonies or something else altogether, more and more horticulturists are choosing a natural approach for combating pest insects. In most cases, there is some sort of natural treatment that can rectify an infestation within a greenhouse or indoor garden. Growers equipped with knowledge regarding the different types of natural pest control will be the best at quickly and effectively treating their gardens. As with any pathogen, the faster a gardener can make a positive identification, the faster the proper treatment can be implemented. When you consider how fast insects can reproduce, a quick response makes all the difference in the world. A better understanding of some of the commonly used natural insect treatments will give horticulturists a leg up when it comes to battling bugs. Neem oil was first discovered as an effective pesticide after swarms of locusts (who eat anything and everything in their paths) avoided feeding on the neem tree. Neem oil extracted from the neem seed is an effective natural insecticide that is commonly found at local nurseries and garden supply stores. When sprayed on to the insect, neem works by suffocating the insect in the oily mixture. Neem also acts as an insect deterrent. Insects that sense the presence of neem will find other places to eat their lunches. The substance Azadirachtin has been isolated from neem and is now used as the active ingredient in other natural pesticide products. Azadirachtin acts as a growth regulator, compromising the insect’s ability to molt. Azadirachtin also works as an anti-ovipositor which means insects will not lay eggs on surfaces treated with Azadirachtin. Spinosad is an all-natural, bacteria-based insecticide. The specialized bacteria (saccharopolyspora spinosa) disrupt the nervous system of insects. Spinosad works on a wide variety of insects but can be more effective during particular stages of an insect’s life cycle. Spinosad is generally most effective on the larvae stage of many insects. For many gardeners, spinosad has become the go-to natural insecticide for the treatment of caterpillars. Bacillus Thuringiensis, or BT, is another natural, bacteria-based insecticide. Spores and crystalline insecticidal proteins that are produced by BT have actually been used to control pest insects since the 1920s. This effective, natural pesticide is still commonly used today. BT is a great alternative to some of the harsh chemical insecticides because BT does not affect humans, wildlife, pollinators, or most beneficial insects. As our knowledge of plant physiology increases along with our ability to extract specific compounds from plants, more plant-based insecticides are being developed. Garlic, clove, cayenne pepper, rosemary, cinnamon, and thyme are just some of the plants that contain powerful insecticidal compounds. Most plant oil insecticides contain a mixture of a few different plant oils. The more we learn about these compounds, the more they will be incorporated into natural pesticides of the future. Combination sprays combine pest control with other products to offer convenience and time savings. An example of this is ORGANOCIDE® 3-in-1 Garden Spray. It is an OMRI listed insecticide, fungicide & miticide that is effective on all stages: eggs, larvae, nymphs and adults, of small soft bodied insects and certain fungal diseases. It is also safe to beneficial or large insects such as bees, beetles, lady bugs & butterflies. It is derived from natural sesame oil and edible fish oil and is heavier that other oils. It is for use in organic gardening of food crops including vegetables and fruits, field crops, greenhouse crops, ornamentals along with other plants and crops. It can is safe enough to spray at harvest time and is safe to use in the home around children and pets. One way to naturally control pest insects in the garden is to use pest barriers or sticky traps. Pest barriers are exactly what they sound like: a barrier that stops the insect from passing. A sticky barrier created around the base of the plant or around the edge of the planting container will stop any crawling insect from ever reaching the plant. Similarly, sticky traps attract and trap flying insects. Hanging a few sticky traps even when the garden does not have an insect problem is a good idea as a preventative measure. In fact, a sticky trap can be a great early detection method and can help a gardener properly identify a pest insect. Don’t let the feminine name fool you. Ladybugs are some of the most carnivorous bugs that live on this planet. Ladybugs are actually winged beetles that have the capability to devour thousands of insects over the course of their life spans (about one year). Ladybugs are my favorite beneficial insect for a few reasons. First, they only eat other bugs which means, in order to survive, they must hunt and destroy other bugs in the garden. Second, ladybug’s larvae are just as carnivorous and will feed on pest insect’s eggs and larvae. Lastly, ladybugs are relatively inexpensive and easy to find. I have treated many pest insect infestations with ladybugs and one thing I learned is that a gardener can never have too many ladybugs. In fact, I recommend releasing at least three times the recommended amount for the garden space. I use this analogy: six wolves hunting a deer will probably get quicker results than two wolves hunting a deer. Although the grower will have to get used to sweeping up dead ladybugs, releasing a ridiculous amount of ladybugs is a great way to put a quick end to an insect infestation. Nematodes are tiny insects commonly found in soil. Predatory nematodes are nematodes that feed on the larvae or eggs of other insects. For horticulturists dealing with a pest insect which has a portion of its life cycle in the soil, predatory nematodes are a great choice. Both thrips and fungus gnats are common pest insects that both have a portion of their life cycles in the soil. Watering predatory nematodes into the soil is an effective way for a gardener to naturally disrupt the pest insect’s life cycle. In most cases, predatory nematodes are not a standalone treatment. Combining predatory nematodes with an insecticide spray or another beneficial insect is the best way to treat multiple stages of a pest insect’s life cycle simultaneously. Green lace wing larvae are ferocious predators which feed on a wide variety of pest insects. These little critters are not picky and will feed on just about any other insect larvae or egg they come in contact with. Many beneficial insect suppliers will sell green lace wing eggs that can be distributed around the garden. Once the eggs hatch, the green lace wing larvae will unleash their carnage on unsuspecting pest insects. Pirate bugs are another opportunist beneficial insect. These tiny beasts feed on thrips, aphids, and even spider mites. Pirate bugs can be effective when other treatments have failed as they feed on multiple stages of the pest insect’s life cycle. This trait makes them a popular choice for treating pest insects which lay their eggs on the surface of the plant. There are a few species of predator mites that can be used by greenhouse hobbyists and indoor horticulturists. These predator mites feed on spider mites and can be used to control a spider mite infestation. Gardeners who decide to try predator mites may want to release a few different species at once. Predator mites are very susceptible to environmental conditions and, in many cases, only one particular species will find the garden’s environment adequate for reproduction. Once established, predator mites are one of the most effective natural pest control measures against spider mites. Companion planting is an all-natural way gardeners can provide extra protection against unwanted insects. Companion planting is defined as the planting of different crops in close proximity to the garden for the purpose of pollination, providing habitat for beneficial creatures, or for natural pest control. 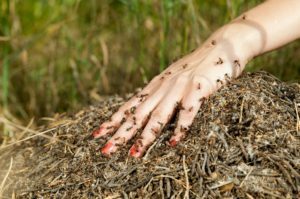 The idea of protecting one’s garden from a pest insect infestation is something every gardener should have in the back of his or her mind. When it comes to early identification and quick eradication of an unwanted visitor, knowledge is imperative. The quicker a gardener can properly identify and implement a treatment program, the less damage a pest insect can inflict. When dealing with pest insects, there is definitely something to be said about the power of prevention. Greenhouse hobbyists who take the extra time to set up sticky traps, insect barriers, or companion plants (known to help deter pest insects) are sure to be one step ahead of the game. If and when a pest insect rears its ugly head, horticulturists who are knowledgeable will be ready to quickly unleash an arsenal of natural pest control and regain the serenity of the greenhouse.